We now offer a color reproduction of this historically accurate oil painting. This reproduction has an image-size measuring 15x24 inches, with large margins. The price for each print: is $25.00 plus $10.00 shipping in 4-inch heavy tube (total $35.00). Maryland residents will be charged 6% sales tax. This battlefield reconstruction is exhaustively based on photography recorded just after the battle at Gettysburg, which ended July 3, 1863. Every attempt has been made to put every discernible mullein plant and granite boulder (as well as its moss and lichen) in its historically proper place. Comparisons of modern and historical photography shows that little has changed in the Gettysburg battle area. Trees and shrubs come and go but granite stays. 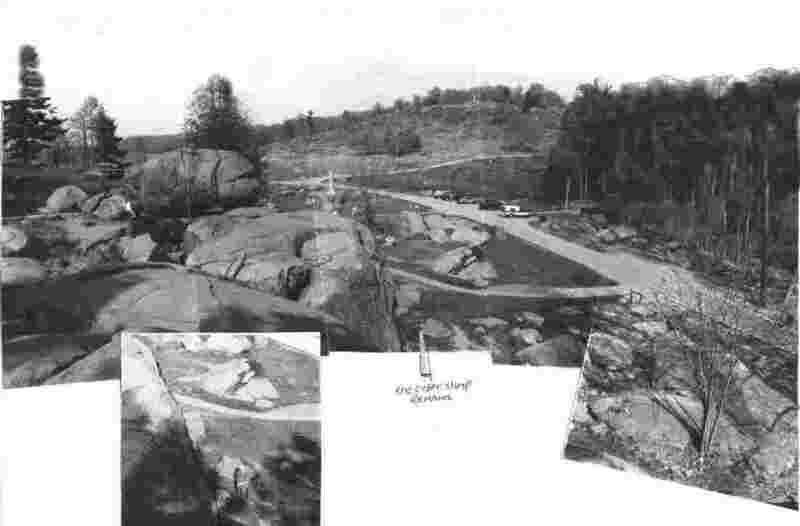 Mr. Groves has chosen the most popular overlook for his "battlescape", the "Duck Rock" (called by the Park "Table Rock") of the Devil's Den area. (When viewed from the parking area these rocks resemble a duck decoy. The viewer hovers 10 feet above and behind the "duck's" back.) The scene is full of battlefield minutia. "Armed" with officers battle reports and the historic photos, the artist has made every effort to present to the viewer an accurate visual analyzation. 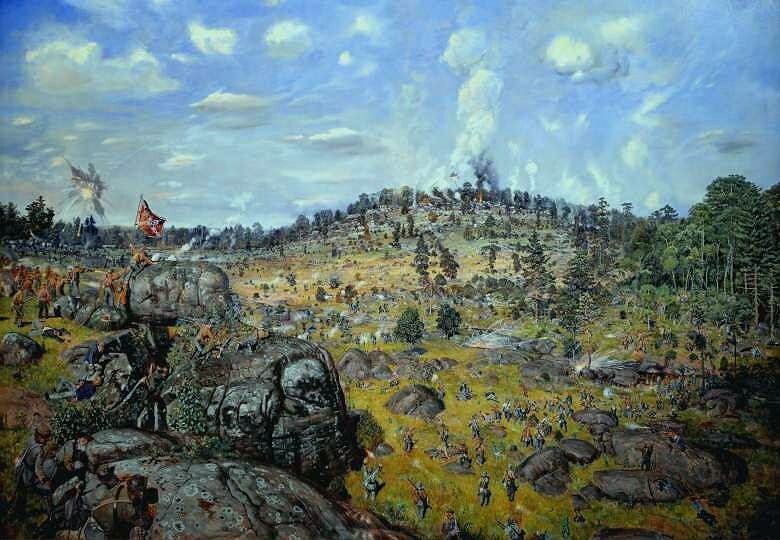 Description: In the distance, right, Little Round Top seems to "erupt" as 3 union cannons fire away at attacking confederates moving up Houck's ridge (left side of painting). Rebel infantry of the 4th and 5th Texas and 15th Alabama regiments attempt to reach the summit on the open south side of the rocky hill, while the 48th, 47th and 15th Alabama regiments attempt to take the wooded side (smoke rising through trees). None will succeed. In the lower left foreground, remnants of the 44th Alabama regiment have successfully grabbed the southern (Devil's Den) terminus of Houck's ridge. 3 of Union Captain James Smith's 4th New York Battery cannon have been captured (not visible but situated just 50 yards to left of Duck rock). Smith has retreated 500 feet to the rear and has commenced firing two final cannon (smoke above the duck's head) at confederates of the 2nd Georgia advancing up the Plum Run Gorge (right and center fore ground). This gorge would become known as the "slaughter Pen" either owing to the numerous cattle or confederates killed within the area that day. 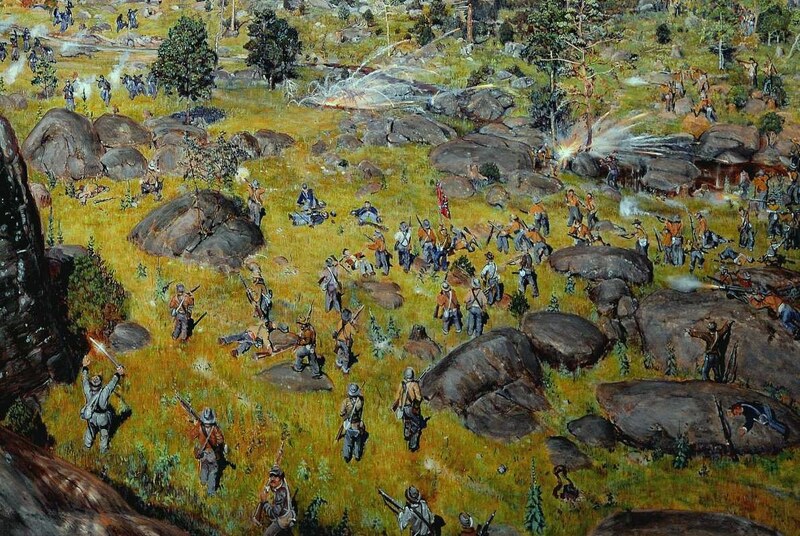 Various probable and actual enactments take place throughout the painting: Above and left of the duck's head a 10 pounder case shot, fired from one of the Little Round Top parrotts, bursts with a deadly scattering effect. In the left foreground an exhausted Col. William Perry (CSA 44th Alabama) directs his major to pull the men back to the cover of the cliffs. Perry's lieutenant points out Smith's cannon and assembling Union reinforcements. The battle for Houck's ridge is winding down as what's left of the 4th Maine, 124th New York, and the 99th Pennsylvania lose and gain repeatedly. Lt. Col. William Shepherd, 2nd Georgia, with sabre reflecting the late afternoon sunlight, attempts to anchor his line with the position of the southern troops atop the Den. One of Capt. Smith's cannon shells nearly causes a friendly fire incident as a 2nd shell knocks a locust tree from its stump and severs the right leg of a luckless Georgian. The same shell probably accounts for most of the dead confederates photographed Sunday at the Plum Run Pond area. Col. Elijah Walker, of the 4th Maine, (fired upon by prone shooter atop the duck's shoulder) implores his men to clear the gorge so that Smith's cannon can sweep the approaching Georgians. A Union cannoneer, gravely wounded has been dragged to relative safety as 3 rebels help to make their flag dominate the "Den" area. Within the center valley the 6th New Jersey volunteers (not visible-behind duck's head) and the 40th New York (right center) are forming a line to drive down the valley in an(unsuccessful) attempt to push back the rebel line. Click here for a summary report on the painting. Click here to visit our Gallery home page.